An architecture firm in Copenhagen recently won an international competition to design a new power plant for the Danish capitol. 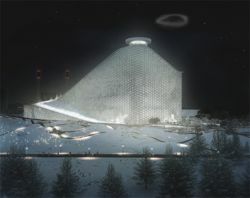 The winning plant not only uses residents’ waste to make energy, but also serves as Denmark’s first and only ski mountain. Lead architect, Bjarke Ingels, tells host Bruce Gellerman about the artificial ski slope and why he thinks that industrial buildings should be more playful. GELLERMAN: You know what to do when life hands you lemons - but what if it gives you a power plant that burns garbage? Well, if you’re architect Bjarke Ingels of Copenhagen - you turn it into a ski slope. 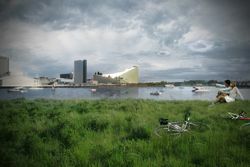 His company, the Bjarke Ingels Group, just won first prize in an international competition that challenged architects to design a new incinerator to turn waste into energy in the Danish capital. Bjarke Ingels joins me on the line from Copenhagen - welcome to Living on Earth. GELLERMAN: So, as I understand it – I’ve seen your drawings and essentially you’re wrapping a ski slope around the smoke stack of this new power plant. INGELS: Exactly like that. 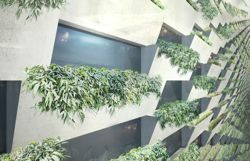 This building transforms all the trash of the Copenhageners into electricity and heating - it’s going to be not only the tallest, but also the biggest building in Copenhagen. We thought that since Copenhagen actually has the climate but not the topography for skiing - we could actually provide the Copenhageners with a man-made mountain that transforms the flat but cold, but snowy Copenhagen into a real alpine sort of man-made skiing resort. GELLERMAN: How many ski trails will you have on this smoke stack mountain? INGELS: They’re going to be able to choose between a green, a blue and a black slope. It’s also going to contain a mogul slope for the experts and a slope for the kids. GELLERMAN: But a power plant as a ski slope? I mean, it sounds kind of environmentally contradictory. INGELS: The interesting thing about this project is that you can say that one of the sort of main drivers of creating a sustainable city is to be able to integrate both the sort of ecological and economical infrastructure of the city into the city fabric itself. So you somehow need to find a way of actually integrating these really big industrial facilities in the middle of the city. So, the challenge of the competition was to make a big factory beautiful. And we thought of just wrapping it in just beautiful wrapping - we would really turn the entire plant into a gift for the citizens of Copenhagen. GELLERMAN: So people are going to take a lift or gondola to the top of the plant and then ski down? INGELS: It’s actually…they’re going to take traditional vertical elevators, just like…unlike normal mountains where you are forced to take ski-lifts, here you can actually take a vertical elevator all the way from the ground to the roof. And, the slope, because in this case it’s a man-made mountain, we can engineer it so all the slopes end up straight at the foot of the elevator. But also as the power plant is going to be interested in displaying its deployment in environmental technologies in the transformation of waste into heat and energy - they’ll also be able to take like a promenade and actually sort of explore the various operations of the factory looming inside the mountain. GELLERMAN: I was reading about the award, and I see that this stack is going to puff out smoke rings. INGELS: We thought that it could be interesting to transform the smokestack itself into a sort of a playful element. Just like the factory becomes sort of a ski slope, the way we designed the chimney is that the mouth of the chimney is in the shape of a giant disk - the hollow space inside the thickness of this disk gradually fills up with smoke, and when it changes 200 kilos of CO2, this chamber compresses and it blows a giant smoke ring. One of the main ideas is of course to turn the symbol of the factory, the chimney, which is also the symbol of pollution, into something playful, but I think more importantly, one of the main drivers of behavioral change is knowledge. If people don’t know they can’t act. In the future, like in 2016, when this plant has been realized, I’ll be able to tell my kids that once they’ve counted five smoke rings, we will have emitted one ton of CO2. This sort of abstract element of a tale of smoke - that’s like ungraspable and uncountable suddenly becomes very basic just like, you know, counting the seconds after you see the lightning flash. You know, just counting the smoke rings you’ll be able to tell how much CO2 we’ve emitted. GELLERMAN: Do you remember sitting around a table with your design team and saying - ‘you know, I’ve got a great idea.’ What did they say to you when you came up with this idea? INGELS: I mean, they gradually realized when we started probing and digging into all the criticism and all the sort of complications, that this was like, almost like the only sensible thing to do with something as big as a giant power plant. And, it was only when we sort of came up with the notion, not only sort of training a building that has an economical and an ecological purpose, you know, it recycles waste into energy - but to give it a social purpose that actually this giant volume becomes a part of the topography of Copenhagen, and contributes to the citizens of Copenhagen and turns it into a destination. GELLERMAN: Well, Mr. Ingels, goodluck with your waste-to-energy ski slope in Copenhagen. INGELS: Thanks a lot. And you’re very much invited to come and test it out with a pair of skis on your feet in 2015. GELLERMAN: (Laughs). I’ll be there. That's Danish architect Bjarke Ingels, whose award-winning incinerator will produce electric power - and skiing pleasure.